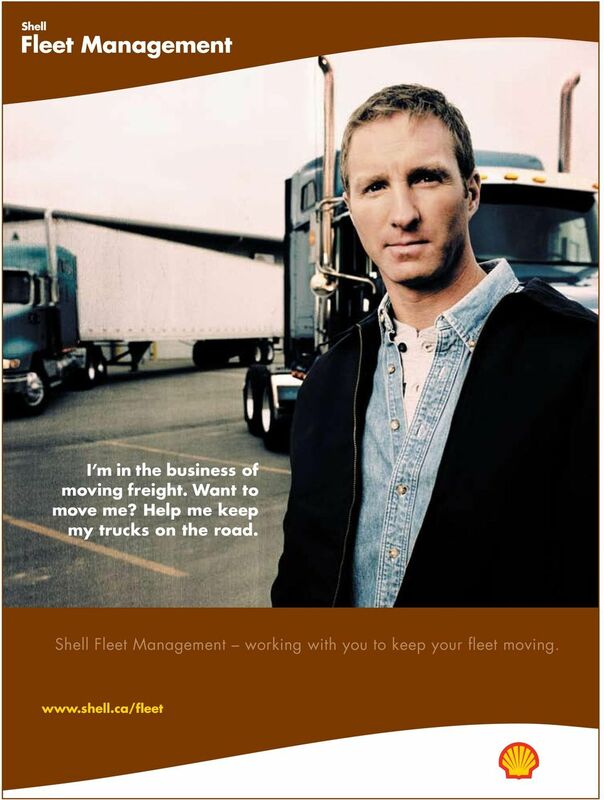 Download "Shell Fleet Management working with you to keep your fleet moving." 1 I m in the business of moving freight. Want to move me? Help me keep my trucks on the road. Shell Fleet Management working with you to keep your fleet moving. 2 At Shell, we understand that the best way to keep your business profitable is to keep your trucks on the move. They need to be ready to go when you are, and you need to be confident that they will not let you down. As the world s leading lubricant company, we realize that it takes more than just great products to add value to your fleet operations. It takes world-class technical support, an eye for detail at everything we do, and an open and honest commitment to help you to maximize operational efficiencies, lower your cost per mile, and get the most out of your trucks. 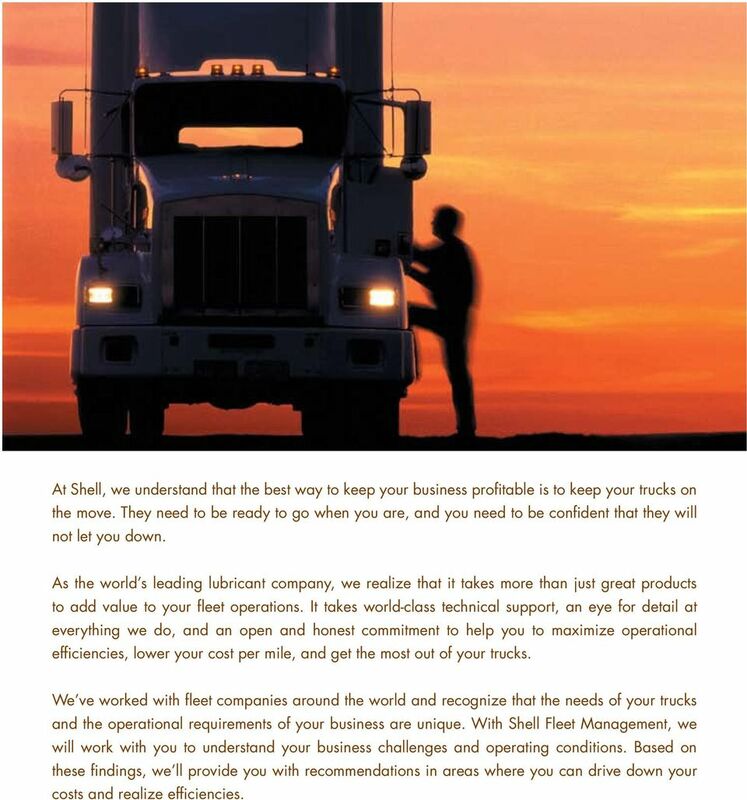 We ve worked with fleet companies around the world and recognize that the needs of your trucks and the operational requirements of your business are unique. With Shell Fleet Management, we will work with you to understand your business challenges and operating conditions. Based on these findings, we ll provide you with recommendations in areas where you can drive down your costs and realize efficiencies. 4 Heavy-duty Engine Oils ROTELLA T heavy-duty engine oil with Triple Protection technology Advanced protection for your engines that helps lower capital investment costs. 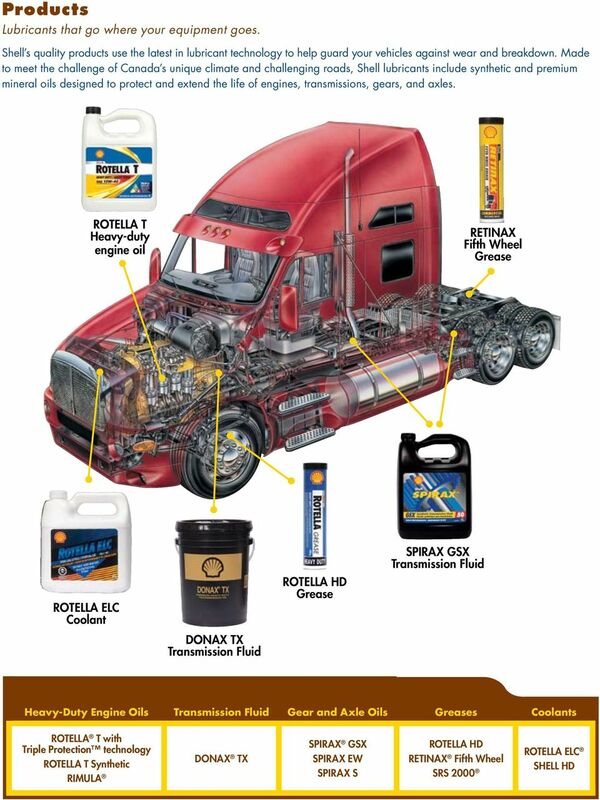 ROTELLA T engine oil provides advanced protection for your hard-working engines. Optimized for today s highperformance, low-emission 2007 diesel engines, this oil also provides excellent performance in older engines. ROTELLA T oil with Triple Protection technology is formulated to significantly improve engine wear and cleanliness, as well as helping to enhance performance and minimize your capital investment costs. Exceptional wear protection that can help to extend the life of your equipment and ultimately lower your capital investment costs; Outstanding deposit control that helps minimize engine maintenance, and maximizes efficiency and time on the road; Control of emissions that prevents harmful ash blockage, helps to maintain fuel economy, and lowers maintenance costs. 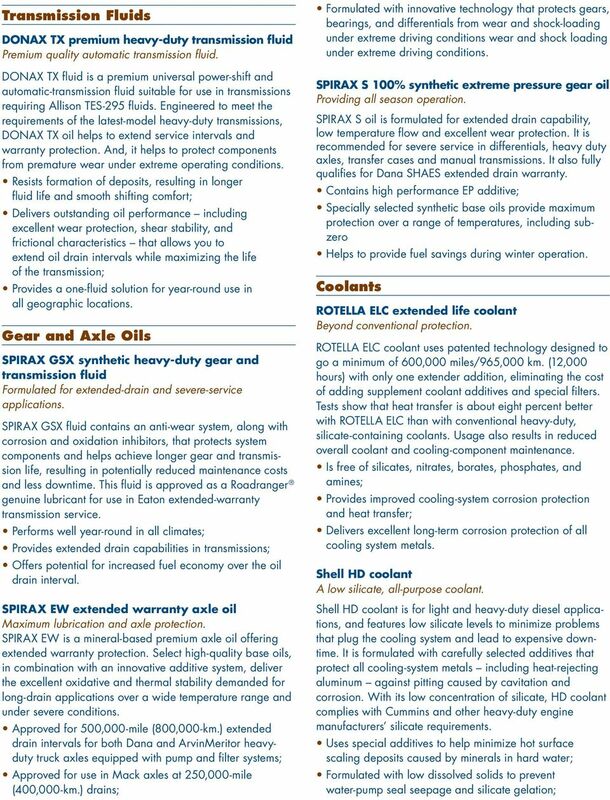 ROTELLA T synthetic heavy-duty engine oils Demonstrated performance in extreme conditions. ROTELLA T Synthetic oil provides extra protection against wear in cold-start or cold-climate operation through outstanding pumping and oil-pressure characteristics. It also offers excellent protection against wear from soot and contaminants, and outstanding protection against breakdown by heat and stress. Contributes to improved fuel economy compared to conventional engine oils; Delivers exceptional performance in severe cold-climate operation; Is suitable for use in a wide range of equipment, including heavy-duty diesel engines. 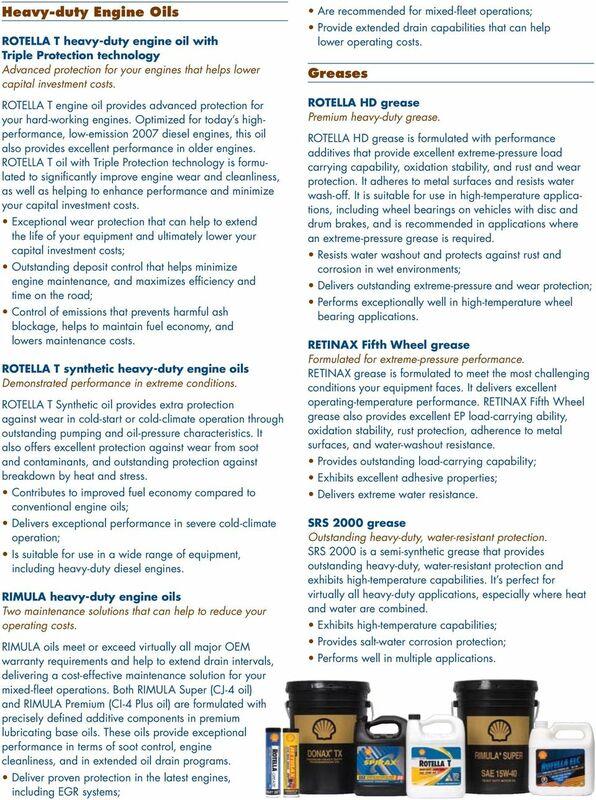 Rimula heavy-duty engine oils Two maintenance solutions that can help to reduce your operating costs. Rimula oils meet or exceed virtually all major OEM warranty requirements and help to extend drain intervals, delivering a cost-effective maintenance solution for your mixed-fleet operations. Both Rimula Super (CJ-4 oil) and Rimula Premium (CI-4 Plus oil) are formulated with precisely defined additive components in premium lubricating base oils. These oils provide exceptional performance in terms of soot control, engine cleanliness, and in extended oil drain programs. Deliver proven protection in the latest engines, including EGR systems; Are recommended for mixed-fleet operations; Provide extended drain capabilities that can help lower operating costs. Greases ROTELLA HD grease Premium heavy-duty grease. ROTELLA HD grease is formulated with performance additives that provide excellent extreme-pressure load carrying capability, oxidation stability, and rust and wear protection. It adheres to metal surfaces and resists water wash-off. It is suitable for use in high-temperature applications, including wheel bearings on vehicles with disc and drum brakes, and is recommended in applications where an extreme-pressure grease is required. Resists water washout and protects against rust and corrosion in wet environments; Delivers outstanding extreme-pressure and wear protection; Performs exceptionally well in high-temperature wheel bearing applications. Retinax Fifth Wheel grease Formulated for extreme-pressure performance. Retinax grease is formulated to meet the most challenging conditions your equipment faces. It delivers excellent operating-temperature performance. Retinax Fifth Wheel grease also provides excellent EP load-carrying ability, oxidation stability, rust protection, adherence to metal surfaces, and water-washout resistance. Provides outstanding load-carrying capability; Exhibits excellent adhesive properties; Delivers extreme water resistance. SRS 2000 grease Outstanding heavy-duty, water-resistant protection. SRS 2000 is a semi-synthetic grease that provides outstanding heavy-duty, water-resistant protection and exhibits high-temperature capabilities. It s perfect for virtually all heavy-duty applications, especially where heat and water are combined. Exhibits high-temperature capabilities; Provides salt-water corrosion protection; Performs well in multiple applications. 6 Services The expertise you expect, the technology you need. 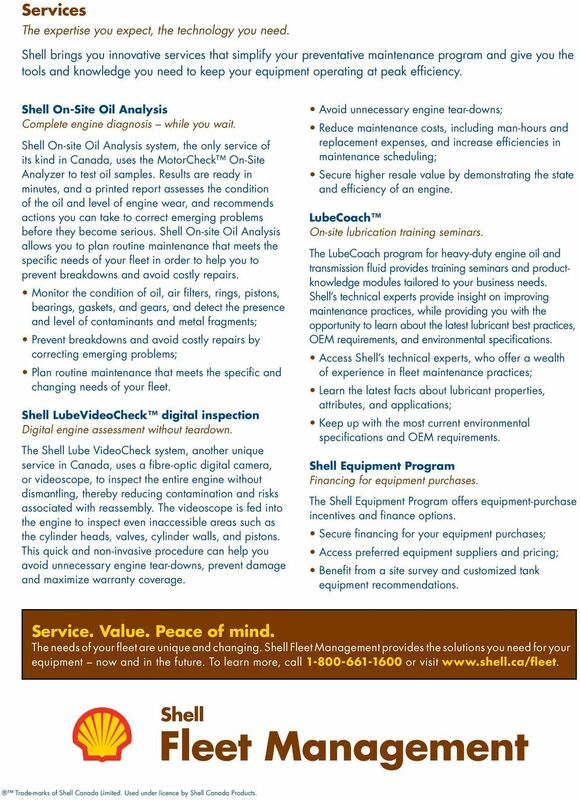 Shell brings you innovative services that simplify your preventative maintenance program and give you the tools and knowledge you need to keep your equipment operating at peak efficiency. Shell On-Site Oil Analysis Complete engine diagnosis while you wait. Shell On-site Oil Analysis system, the only service of its kind in Canada, uses the MotorCheck On-Site Analyzer to test oil samples. Results are ready in minutes, and a printed report assesses the condition of the oil and level of engine wear, and recommends actions you can take to correct emerging problems before they become serious. Shell On-site Oil Analysis allows you to plan routine maintenance that meets the specific needs of your fleet in order to help you to prevent breakdowns and avoid costly repairs. Monitor the condition of oil, air filters, rings, pistons, bearings, gaskets, and gears, and detect the presence and level of contaminants and metal fragments; Prevent breakdowns and avoid costly repairs by correcting emerging problems; Plan routine maintenance that meets the specific and changing needs of your fleet. Shell LubeVideoCheck digital inspection Digital engine assessment without teardown. The Shell Lube VideoCheck system, another unique service in Canada, uses a fibre-optic digital camera, or videoscope, to inspect the entire engine without dismantling, thereby reducing contamination and risks associated with reassembly. The videoscope is fed into the engine to inspect even inaccessible areas such as the cylinder heads, valves, cylinder walls, and pistons. This quick and non-invasive procedure can help you avoid unnecessary engine tear-downs, prevent damage and maximize warranty coverage. Avoid unnecessary engine tear-downs; Reduce maintenance costs, including man-hours and replacement expenses, and increase efficiencies in maintenance scheduling; Secure higher resale value by demonstrating the state and efficiency of an engine. LubeCoach On-site lubrication training seminars. The LubeCoach program for heavy-duty engine oil and transmission fluid provides training seminars and productknowledge modules tailored to your business needs. Shell s technical experts provide insight on improving maintenance practices, while providing you with the opportunity to learn about the latest lubricant best practices, OEM requirements, and environmental specifications. Access Shell s technical experts, who offer a wealth of experience in fleet maintenance practices; Learn the latest facts about lubricant properties, attributes, and applications; Keep up with the most current environmental specifications and OEM requirements. Shell Equipment Program Financing for equipment purchases. The Shell Equipment Program offers equipment-purchase incentives and finance options. Secure financing for your equipment purchases; Access preferred equipment suppliers and pricing; Benefit from a site survey and customized tank equipment recommendations. Service. Value. Peace of mind. The needs of your fleet are unique and changing. Shell Fleet Management provides the solutions you need for your equipment now and in the future. To learn more, call or visit Trade-marks of Shell Canada Limited. Used under licence by Shell Canada Products. HOLLAND MARK V LANDING GEAR THE LANDING GEAR THAT EXCEEDS THE STANDARDS FOR STRENGTH, DURABILITY, AND EASE OF LIFT.